Water intrusion is one of the most frequent causes of post-construction building problems in the U.S. today. In addition to compromising the structural integrity of a building, excess water can also lead to serious mold growth and related health problems for occupants. The best way to safeguard your structure against water intrusion is to install a waterproofing and/or drainage system. ARID Resources has several solutions available. In addition to waterproofing systems, we also offer water repellents, elastomeric coatings, joint sealants and caulking to protect against water intrusion. ARID installs interior and exterior drain tile systems to keep water out of your building. We offer both gravel and gravel-less drain tile systems. Other solutions include the installation of sump pumps to move intruding water away from the structure. 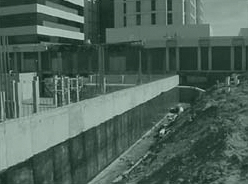 ARID Resources offers a range of structural waterproofing options that can be tailored to unique building structures. Our structural waterproofing options include: protection/drainage boards, elastomeric membranes, and sheet membranes (spray-on, roll-on or peel-n-stick).